So since I’m probably going to be writing a lot about places in Hong Kong, allow me to present a short overview of Hong Kong geography. With a touch of history. The name “Hong Kong” is usually rendered in English as “fragrant harbor,” though what exactly was so fragrant is not 100% clear: possibly the Pearl River delta, possibly incense stored for shipment in Aberdeen Harbor on the south side of Hong Kong Island, on which see more below. Here is a link to Google maps for your zooming-and-panning pleasure. Now for an awesome older map, from ca. 1900 (via Hong Kong’s First). The area surrounded by the thick dark gray line is Hong Kong. If you click on the map to see it in a larger format, you’ll note Hong Kong Island in the bottom center, with the town of Victoria on the northwest side. Above that is Kau-Lung—Kowloon—the peninsula right across Victoria Harbor from HK Island. 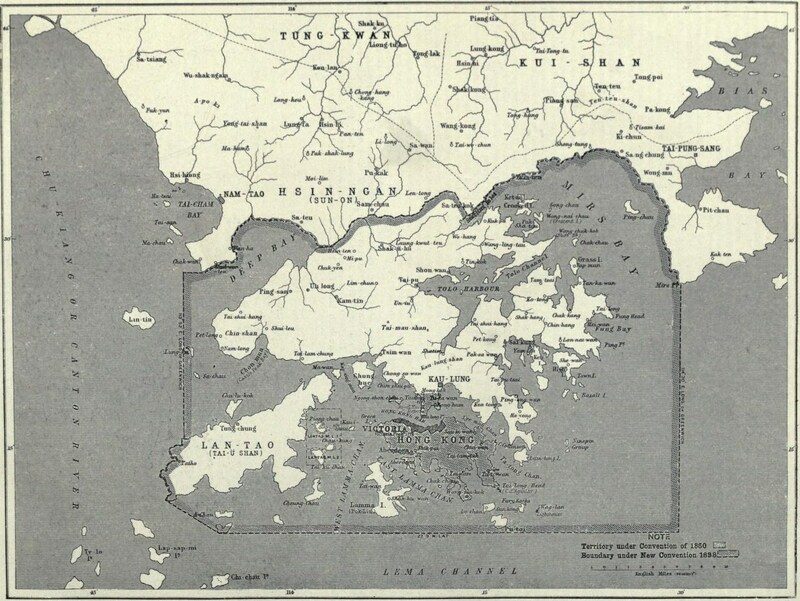 The final piece is the New Territories, which aren’t labeled on this map, probably because it was created just a few years after the New Territories became part of HK. So the way it plays out historically is that HK Island was ceded to the British in perpetuity in the 1842 Treaty of Nanking, following the defeat of the Qing Dynasty in the First Opium War. The FOW was a super-shady undertaking wherein the British basically waged war on China over some complex negotiations that included how much opium the British could import and how many middlemen they had to work through. You know who has a nice readable summary? Wikipedia does. Read it and get back to me. Kowloon became part of HK, again ceded in perpetuity, in the 1860 Treaty of Peking, which concluded the—no joke—Second Opium War. (Also included was Stonecutters’ Island, where these guys hang out.) The SOW was a lot like the first, except it also included the French. 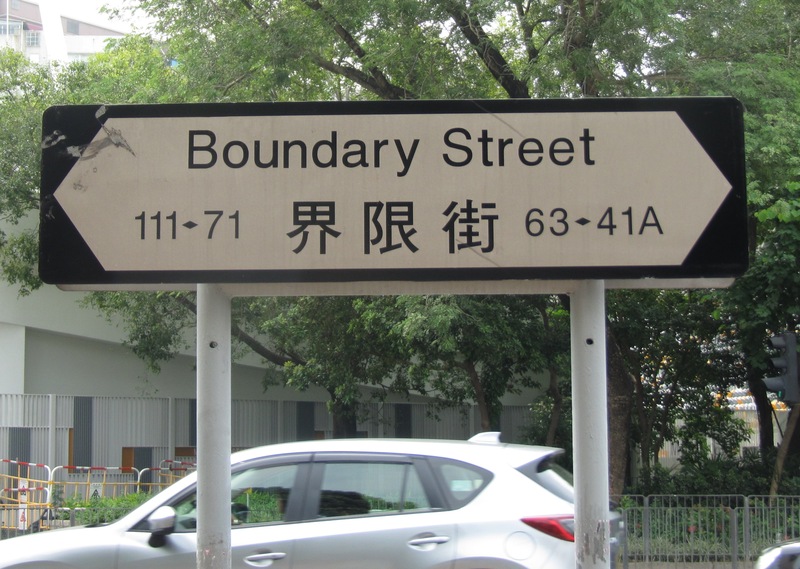 Hence on the above map, the top of the map key includes an indication for “Territory under Convention of 1860.” You may not be shocked to hear that the northern boundary of Kowloon was called Boundary Street. It still exists. We live about a mile north of it. Finally, in 1898, the British took out a 99-year lease on some new territory: Lantau Island (“Lan-Tao” on the above map) and the land north of Boundary Street up to the Sham Chun River (which is the boundary between HK and mainland China). This new territory is known as the New Territories. “New Kowloon” is technically, administratively, a part of the New Terrories, though most people think of it as Kowloon. (That’s how taxi drivers think of it, for sure). It stretches from Boundary Street north to the mountains we see from our windows. 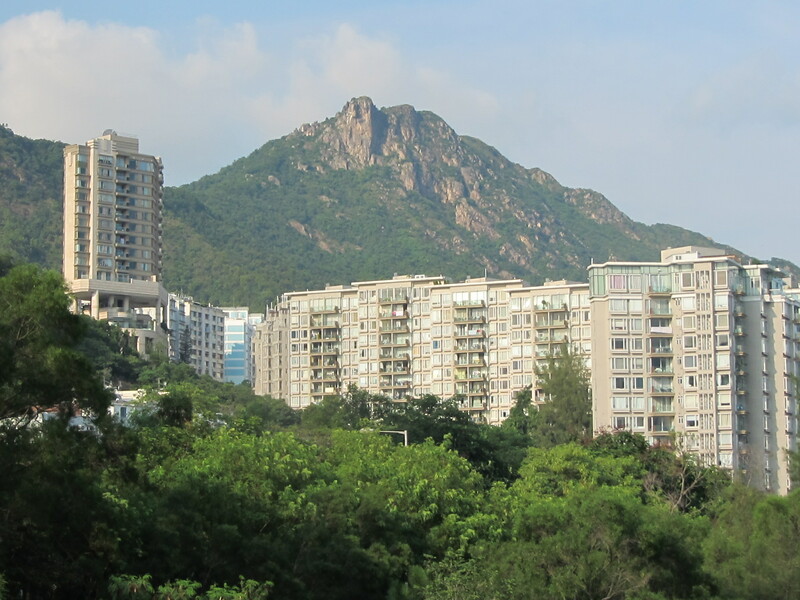 These mountains are what give Kowloon its name, in fact. “Kowloon” means “nine dragons,” which refer to the eight mountains plus a late-thirteenth-century Chinese emperor. That’s Beacon Hill above. Beyond those mountains are the real New Territories, which (fun fact) represent 86% of HK’s land. Note that the New Territories were not ceded in perpetuity to the British—it was a 99-year lease. 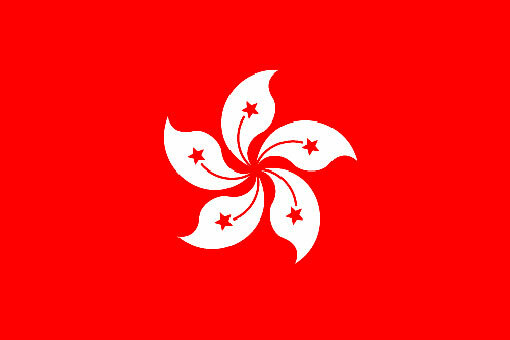 In principle, the British could have retained control over HK Island and Kowloon (south of Boundary Street, of course), but by 1997 the New Territories were too integral a part of HK’s entire economy—and as the supplier of fresh water to boot—that it would have been impractical, likely impossible, to separate the New Territories from the rest of HK. So on July 1, 1997, amidst much pageantry and playing of “Auld Lang Syne,” the entirety of Hong Kong was returned to China (video here and here), though the relationship of HK to China continues to be, as some previous posts have noted, more than a little tricky. On which topic, more later. Could you post some kind of map that shows where you live, e.g. in relation to the Hong Kong cityscape we’re used to seeing? Apologies if you’ve already done this and I missed it.